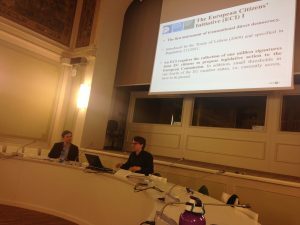 Raffael Fasel (Cambridge) and Manès Weisskircher (EUI), Human and Animal Rights: From the Enlightenment to the Twenty-First Century. 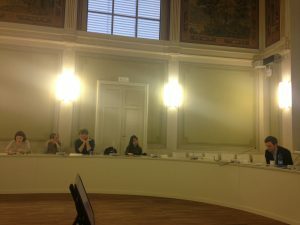 The Constitutionalism and Politics Working Group had the pleasure to organize the event: Human and Animal Rights: From the Enlightenment to the Twenty-First Century – Work in progress presentation and discussion by Raffael Fasel (PhD Candidate in Law at the University of Cambridge) and Manès Weisskircher (PhD Candidate at the EUI, SPS Department). On Tuesday, 28 March 2017, 5-7 pm, Sala Teatro, Badia Fiesolana. 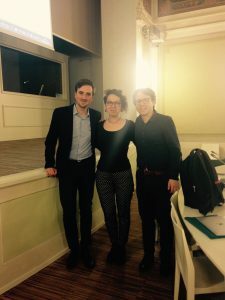 The presentation approached the philosophical foundations of animal and human rights and some of the most interesting contemporary debates regarding the struggles and mechanisms to ensure that these are protected. Abstract: Human rights and human dignity bear many similarities to the privileges and high rank aristocrats used to possess. Both human beings and aristocrats hold their rights and privileges simply in virtue of being born into a dignified status. This status guarantees the equal rights of all its members, and excludes from right-holdership all those not belonging to it. The paper argues that contemporary human rights and dignity approaches are best understood in light of this analogy, and spells out the principal features and weaknesses of this aristocratic conception of human rights. Bio: Raffael is a PhD candidate in Law at the University of Cambridge. He is a Graduate Workshop supervisor in Jurisprudence and Managing Editor of the Cambridge International Law Journal. Raffael is also the convenor of the Talking Animals, Law, and Philosophy talk series. He holds a Bachelor of Law and a Master of Law degree from the University of Fribourg, an MA in Philosophy from University College London, and an LLM from Yale Law School. Currently, Raffael is a visiting researcher at the University of Oxford. Abstract: The Treaty of Lisbon (2009) introduced the European Citizens’ Initiative (ECI), the first-ever transnational instrument of direct democracy. So far, only three campaigns have managed to collect the required number of one million signatures. One of them was Stop Vivisection, an animal rights campaign against animal experimentation in scientific research. This paper answers two key questions: How did the Stop Vivisection organizers manage to mobilize effectively? And what were the consequences of their mobilization effort? Referring also to the two other instances of “successful” ECI campaigns, the paper provides a more general empirical perspective on the shortcomings of the ECI as a democratic instrument. 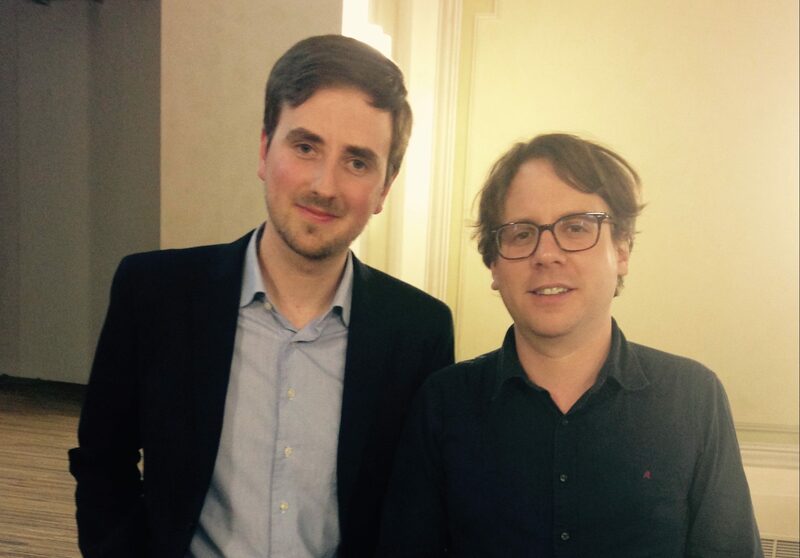 Bio: Manès is a PhD researcher in Political and Social Sciences at the EUI. He is interested in comparative politics, especially in the study of social movements, political parties, and democracy. More specifically, he has written on animal rights, the left, and the radical right. His research has been published in Government & Opposition (forthcoming) and in the Journal of Intercultural Studies. In addition, he has contributed to the LSE blog, openDemocracy, the Jacobin, and science.orf.at, amongst others. Currently, he teaches at the University of Vienna (Comparative Politics) and previously he has thought at the University of Bucharest (Social Movement Studies). Thank you everyone for coming! Below are some pictures from the event! We Stand With CEU! We Stand For Academic Freedom!